Connie, Thank you for being the best dance instructor! You would have been so proud of us. We got through the entire dance without any mistakes and people were very impressed. Thank you for helping make our special night even better. Connie, Thank you for taking the Kate Gosselin and Michael Bolton of amateur ballroom dancing and turning us into pros (to the untrained eye). The lessons, the encouragement, and the final product were priceless and memorable. Connie, Thank you for your patience and time. OUr first dance was wonderful but the biggest gift was accomplishing it as a couple. Hi Connie! I have to tell you that Tim and I did AWESOME for our dance at the wedding! We were able to run through the routine a few times on Thu. & Fri. nights and we felt pretty comfortable with it. Just a little bit of butterflies, but not bad. Tim said he doesn't even remember the music - haha. When we were doing our first grapevine, I remember the hoots & hollers & clapping from the crowd and the applause at the end was awesome! Our son was 'freaked out' and our daughter was crying. We really pulled it off! A quote from the DJ......."I've seen a lot of couples who took a few dance classes try to do what you just did, but yours was the best I've ever seen". We couldn't have done it without you. Thank you for being a great dance instructor & choreographer. We wish you could've seen us - we'd like to think you would've been proud. Thanks for everything and perhaps we'll sign up for another round of dance classes with you! We both would like to let you know that we really enjoyed your class and appreciated your personable, calm and skilled teaching style. Your love of dancing is very infectious and that made the whole experience even more enjoyable. Looking forward to doing more classes with you soon. Connie, I just wanted you to know what an awesome experience this has been for me. I've always thought of myself as a "clutz" who could never learn to dance. So, beginning to learn to dance, AND beginning to love dance, well what can I say. I'm already planning to enroll in another class. Thanks! Connie, I just want to say thanks for the fun ballroom dance instruction you provide. I found it comfortable, effective (clear voice, concise messages, learning based on what was just learned, etc.) and most importantly fun. Thanks. Thanks, Connie. We had a great time. It was lots of fun, and you're a great teacher! The steps were well explained and the positive attitude of the instructor carried over to the students. A patient teacher and great instructor. Instructor was terrific. Very supportive and energetic. I liked how we learned a little of each of the dances at a time and incorporated similar steps into each dance. Made the learning very easy. A great amount of time dedicated to each dance and great variety of dances. Feel like I have the ability to dance to any situation and mix and match dances as needed. The instructor was knowledgeable and patient. The instructor having us go through repetition of material in each class and the review of all the steps we'd learned was extremely helpful and helped to reinforce what we had learned. My boyfriend can dance now! 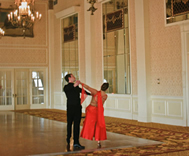 We worked on three types of dances which were perfect for the majority of ballroom settings. Great instructor! Was very receptive to our pace, ability, never judgemental, always energetic, prepared, professional and positive. Learning the dances in a fun, supportive environement was very nice. The instructor was wonderful and very attentive to everyone. My wife and I had a wonderful time at our dance class. Thanks for your teaching and patience. Great instructor. Very thorough and easy to understand. You have a very enjoyable way of teaching! The instructor was a great part of this class. Made it a fun learning environment. Was a warm, friendly, informative, non-competitive learning atmosphere. Enthusiastic instructor who gave everyone plenty of time to practice what we'd learned and ask questions if we needed help. Was a great class. We came back and took it back-to-back and feel like we learned even more the second time around. Instructor was very supportive and professional. Instructor made it so easy and fun every single class! It NEVER got boring. Made for the best part of my weeks! Class was taught slow enough so everything was understandable and attainable but yet moved at a fast enough pace that you never got bored. Teacher was sharp and knew her stuff. Class moved at a great pace. This was a new, exciting, comfortable atmosphere to learn. Teacher was excellent. The instructor was great! She smiled, was always happy to be there, always on time and ready to go. She was encouraging and didn't belittle any of us first timers. Even my reluctant partner returned willingly. The instructor kept us moving through the techniques so we got things done but also had a lot of variety. The instructor had a excellent encouraging manner. The review each class was very helpful. I loved that the instructor didn't make us dance with other partners all the time. It was great to learn all the dance moves and how to do them the right way. This was a fun class and we learned a variety of dances in each class. This was a GREAT class! Please do it again. More Ballroom Classes! We loved this instructor. We appreciated the slow step-by-step approach to the dancing. At no point did we feel overwhelmed or that the class would be too difficult. We had no prior dance knowledge and really felt we learned more than initially expected. Connie is a fantastic and patient teacher. Thanks so much Connie! Lots of patience and variety of steps. Thanks Connie! I have had a great time being here at the dance classes each week. It was so much fun and I'm sad to see it end. The relaxed atmosphere made it easy to learn and always felt very comfortable. Thanks for a great four weeks! Great fun. Exercise without knowing it. Never thought we'd make it through the class but would definately do it again. It would take a supernatural dispensation to lower her to the level of complete excellence. She was great! Enjoyed the class a lot. A very good teacher who puts you at ease. Connie does an excellent job of explaining the steps and you can tell she genuinely loves to teach and dance. We'd advise anyone to take this class! Connie is an excellent teacher and makes the class so much fun! The best part about this class was being able to dance with my husband and have so much fun. Connie was great at teaching so much in such little time. Connie has so much enthusiasm and love for dancing. You can really tell. Very fun. Connie is extremely patient with everyone and encouraged us to go with the flow, have fun, and just enjoy dancing. Connie is very clear in instruction, patient and pleasant to be with. Just great! I'm going to recommend to my friends. Instructor was awesome. Really knew how to teach and enjoyed teaching (you could tell). Patient and understanding of everyone's handicaps. Took the time to work individually with each couple, give them pointers, encouragement, or help. I love to dance and never get the chance-I enjoyed it very much and you are a wonderful instructor. If at anytime you are having more classes and know of someone who loves to dance and does not have a partner, please keep me in mind. Thank you again. It was a ball.